Home → Trash Bags (Liners) → Pet Pick Ups,polyethylene sourced from 100% reprocessed industrial plastic, 000050-Wicket, 1,500 bags per case, sold as one case. 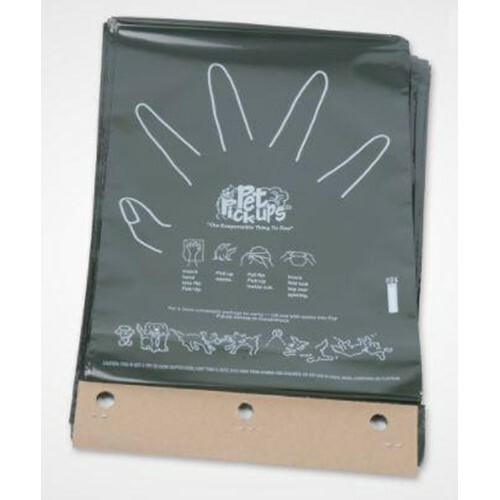 Made of polyethylene sourced from 100% reprocessed industrial plastic, these bags contain an additive that enables them to break down with the help of sunlight and heat. Each bag measures a generous 9 1/4??? x 13 1/2?? ?, and 1 mil in thickness. There are 50 bags per refill wicket, ensuring less loss due to misuse and vandalism. 30 wickets per case. (Each case has 1500 bags in it!) Pet Pick-Ups brand dispensers can hold up to 3 wickets.